Reported cases of elder abuse are increasing throughout the United States. At the same time, identification of elder abuse issues by courts is considered “fair” or “poor.” To address the increased numbers of reported cases—particularly those where the victim is in an ongoing, trusted relationship with his or her perpetrator—the justice system must develop a concerted approach to resolving elder abuse cases. 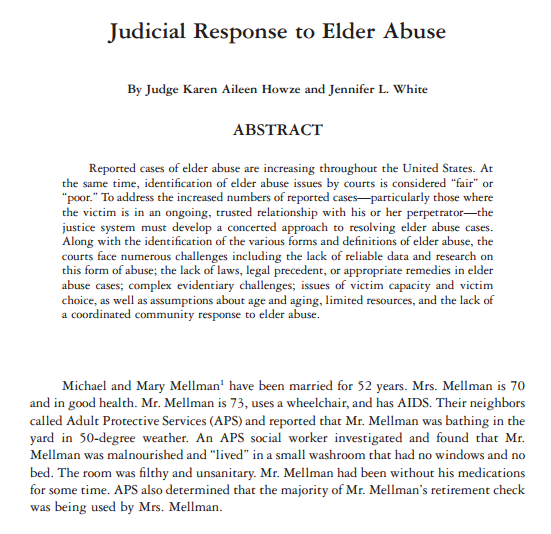 Along with the identification of the various forms and definitions of elder abuse, the courts face numerous challenges including the lack of reliable data and research on this form of abuse; the lack of laws, legal precedent, or appropriate remedies in elder abuse cases; complex evidentiary challenges; issues of victim capacity and victim choice, as well as assumptions about age and aging, limited resources, and the lack of a coordinated community response to elder abuse.